Sure, it’s closely related to the Moto X, but Verizon’s Motorola DROID Ultra has enough distinction of its own to be considered different from its sibling. Being a part of the latest generation of DROID branded smartphones, the DROID Ultra not only emphasizes its super slim profile over other rival phones out right now, but it packs along some unique software features that mimic’s the iPhone’s simplistic operation. Unlike the last several versions of the beloved iPhone, this 7th generation iPhone finally sees a huge overhaul to its software experience in the form of iOS 7 – something that’s been longingly desired. Now that we have it, along with the usual set of incremental upgrades, does the Motorola DROID Ultra stand a chance against it? Okay, as we intently look at the two, we can’t help but realize that their overall designs haven’t changed much over their predecessors. It’s not a surprising thing, naturally, seeing it’s a common occurrence in the landscape, but nonetheless, we find their designs to be appealing on the same level – so it simply depends on what entices you more. Between them, we’ll say that the iPhone 5s has the more premium construction, as its brushed aluminum casing and solid construction helps to give it more precedence. Despite being outclassed by materials regarded as being more premium, the DROID Ultra still has a solid construction of own – plus, its carbon fiber pattern really helps to give it a unique look of its own. 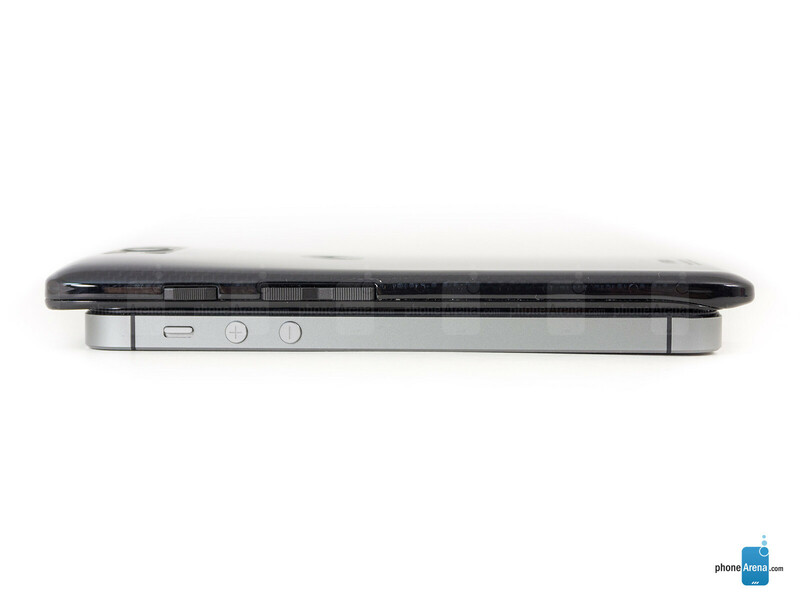 Indeed, the DROID Ultra has the larger footprint, making it a bit more unwieldy to hold in the hand over the compact iPhone 5s, but despite that, its curved sidings help to make it feel comfortable. Oppositely, those chamfered edges on the iPhone 5s make it feel a bit sharp! Feeling out their respective power and volume buttons, we don’t find one set to be superior over the other, since they’re both distinctive, raised, and offer spring responses when pressed. As for the rest of the stuff around their trims, they pretty much boast the same set of things – like their microphones, 3.5mm headset jacks, and respective power/data ports. Around back, they’re naturally armed with some impressive camera gear. 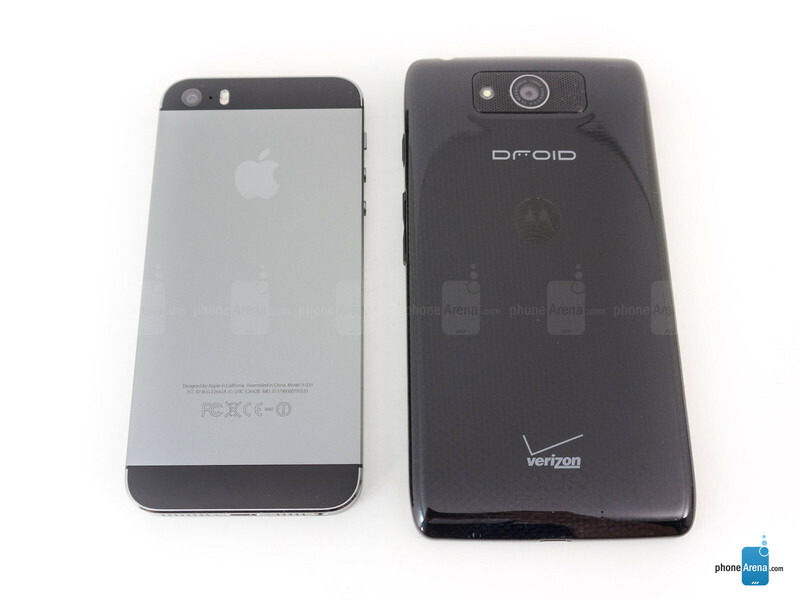 Specifically, it’s an 8-megapixel iSight camera on the iPhone 5s , meanwhile, the DROID Ultra is flaunting a 10-megapixel “Clear Pixel” camera. Let’s be frank here people! 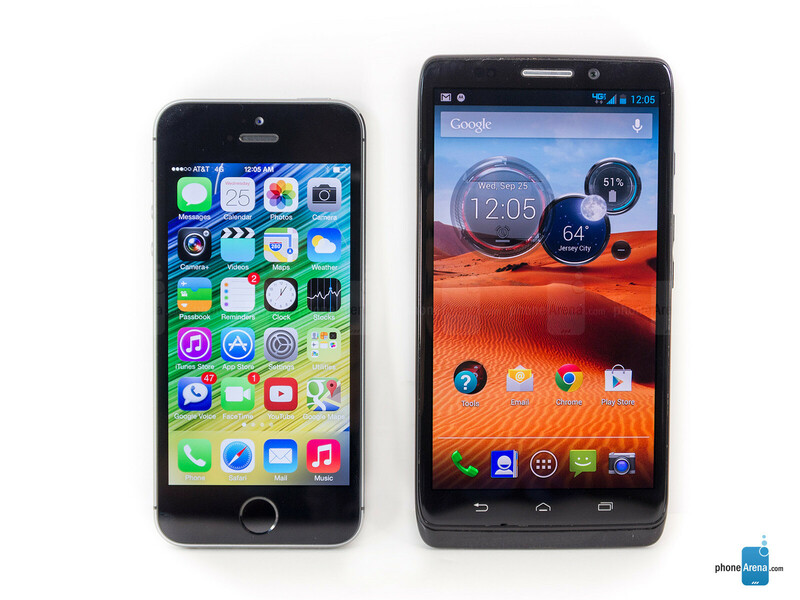 Neither display on these flagship smartphones are regarded as cutting edge, since they’re rather modest with their specs. 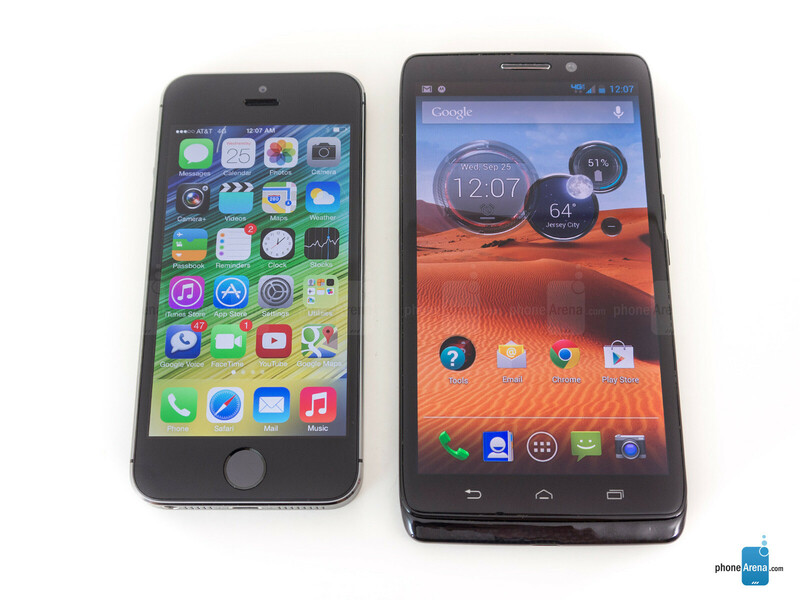 To me more specific, it’s a 4-inch 640 x 11356 IPS LCD based Retina Display on the iPhone 5s – while the DROID Ultra has a larger 5-inch 720 x 1280 AMOLED panel in its body. Obviously, there’s a huge size disparity between the two, as the DROID Ultra adds a full inch to its size, making it ideal for things like surfing the web or watching videos. However, there’s a slight detail advantage to the iPhone 5s due to its pixel density of 326 ppi, which edges out slightly the DROID Ultra’s 294 ppi tally, but it’s almost indistinguishable from a normal viewing distance to adequately differentiate them. Utilizing different display technologies, they have their own unique strengths! With the iPhone 5s’ IPS LCD panel, it exhibits the more accurate looking colors – plus, it offers the better outdoor visibility. On the flip side, the AMOLED panel of the DROID Ultra is able to catch some glances of its own, thanks in part to the vibrant and over saturated colors it’s able to emit, however, its screen washes out under outdoor usage. Droid Ultra wins. Side note: So the comments about the flaws of PA were deleted. Cool. "This article isn't even about the Moto X" was the moderator's comment. That's all right. I posted the evidence in the Moto X comparo as well. Without profanity either, since immediately after my comment here was wiped out, my first comment on the Moto X comparo was deleted too, with the comment "watch your language." The timing is funny, since that comment had been left alone until now. But whatevs. I'm going to be one angry Sniggly if Phonearena never does updated camera comparisons with the new Motorola software, on the Moto X OR the Droid Ultra. They never will. After all my efforts in trying to get the rating for the Note 3 fixed, nothing has changed and I was limited for a week. Luckily I know 1000x more than the average consumer when it comes to cell phones so it's disregarded in my book. All I ask for is honest, up to date reviews. What's so hard about that? EDIT: Sniggly got limited. Are you serious? Not anymore. I don't know why the temp ban was lifted, but I won't look a gift horse in the mouth. I'm going to walk away before I attract any more trouble right now. Comments don't get deleted, unless they are spam/advertising or double posts. When some post doesn't meet the forum rules, it should be moderated - this happens by getting it "hidden". When it is moderated, it can still be opened manually by anyone who wants to read it. In the discussion options, you can select to see such comments. When commenting the "flaws of PA" you should keep to the correct discussion. Or the posts will get moderated. And you shouldn't violate the rules - use bad language, troll, etc. Phone Arena Forum Rules A discussion is a place, where people can voice their opinion, no matter if it is positive, neutral or negative. However, when posting, one must stay true to the topic, and not just share some random thoughts, which are not directly related to the matter. Things that are NOT allowed: Off-topic talk - you must stick to the subject of discussion Trolling - see a description Flame wars Offensive, hate speech - if you want to say something, say it politely Spam/Advertisements - these posts are deleted Multiple accounts - one person can have only one account Impersonations and offensive nicknames - these accounts get banned Moderation is done by humans. We try to be as objective as possible and moderate with zero bias. If you think a post should be moderated - please, report it. Seems I've been un-limited for now. I actually had no awareness of the option to open up moderated comments prior to you posting this. I thought that option had been removed, as it used to be much more obvious. I went a little overboard, but my original point still stands. I won't discuss it further here, since it pertains to the Moto X and not the Ultra. I'll also try to follow the rules more closely from now on. Just making it clear: it is perfectly fine to post comments that disagree with someone else - whether it's another user or the PhoneArena team. It is perfectly fine to say that we are wrong. However, don't do it by cursing and flooding or abusing. Okay, so I've said you're wrong. Do you intend to address the issue I pointed out in the Moto X comparo? And also with what I pointed out please. I'm trying to give PA feedback on their work. Yes it wasn't presented in the best way possible, but mistakes happen. Just trying to help the site out. You can reply to the email you received for the warning. Also, in the rules popup, you can see a contact form. Snig, why trip dude? In the end it's just a phone bro, all that mattress is that it works for you. We all get bashed for our choices, who cares dude? You're an android guy, I'm an iOS guys who like android also, everyday we get hit, so what. Look what happened to Troll, and GoogleSafariFox "banned". It's not worth getting kicked out the community dude, when people are gonna say what they want anyway. EDIT: Not taking the chances with what I wrote originally. Thanks for addressing the issue PA. The comments weren't deleted. Up top by the follow options there's another options link, which does allow you to see hidden posts. All my posts are still here. It did use to be more obvious how to make those posts visible, though I guess the new interface makes it cleaner for those who don't care to see moderated comments. And in a technical sense the mods are right. The update isn't available for the Droid Ultra, so for right now the comparison is fair. My issue with the Moto X comparo doesn't pertain to this situation, and surprisingly John V. gave the Droid Ultra a more favorable conclusion anyway. Offtopic: I will tell you a dirty little secret. John V uses Moto X as one of his own personal phones. Okay, that made me chuckle. Since he does, will John then post an updated comparison, since he surely has the update now? You guys do an absolutely great job PAT. This site has become extremely disrespectful, and overran with fanboys of all camps. Now it's to the point, where the reviewers can't even state their opinion in an area where what's best is subjective, and based on preference. Nice to see the PAT cracking down, on this crap, and cleaning the sight up. This is a tech site, what's best for some isn't for others, and the reviewers do their best to be fair. Stop whining and just enjoy your purchases. +10 PAT. Let's be honest though dark, it was kind of shady for John V. to use pictures taken by the Moto X 2 weeks before the update was released and use them in a review that was just published yesterday when it's a very well known fact that the update MAJORLY improved the camera. That's what Sniggly's and Smurf's comments were about. However, they should have kept those comments in the Moto X vs iPhone 5S comparison because they are kind of irrelevant here, which is against the rules. I agree berserk. My focal point though is the blatant going overboard, the language, and disrespect toward the PA users/reviewers. That's doing too much dude. There's more to it than that. Just letting you know. I was very dissapointed when I saw those 4 inches again on iPhone 5s. But I think next year we will have a better comparison of iPhones with other handsets if they will increase the screen size. If not then ,,Au revoir'' market share, Android will kill every other smartphone. Considering how I read so many comments here that PA or John V are iFans, I'm really happy to see some very good reviews here. I'm an android guy ATM, but I feel that John V is overcompensating the review by being too muted about the iP5 in order to address the view that he is a fanboy. Anyhoo, if only there were 'speed tests' for app opening times, browser page loading, gaming speed and frame rate, etc. Then time lapse video of battery tests, say an HD movie on video loop or a long journey on sat nav, or an hour of gaming etc etc. Then subjective things like the visual design of apps including typography, smoothness and responsiveness of homescreen/app UIs and their consistency. I believe these things make for a good smartphone experience. My N4 is the closest thing on android to that experience on the iphone without any of the iOS handicaps. i cant really say about this because if its ultra not x i will choose 5s. I love Motorola's latest devices, but the pixel density on the Ultra/Maxx really brought them down a notch. 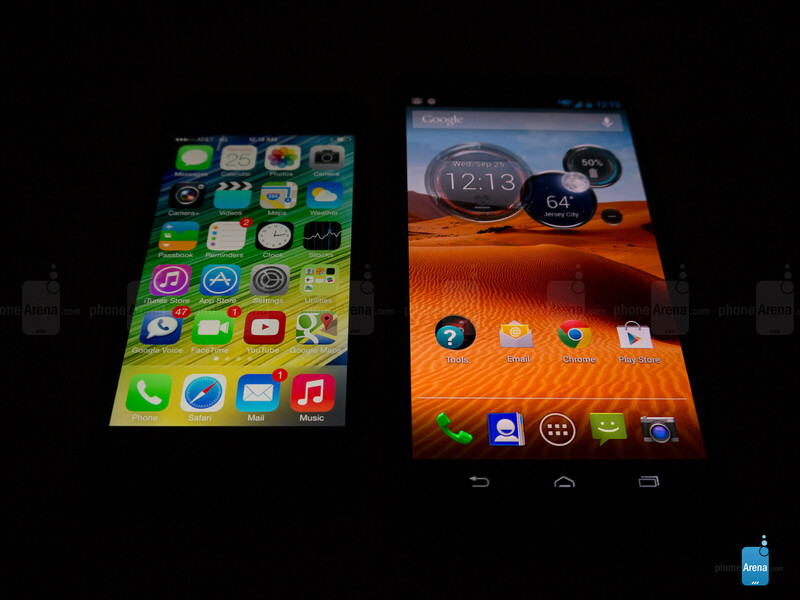 That's why I got the Droid Mini, I would rather have a smaller dense display than a bigger low density display. Otherwise, the Ultra would be the winner.